German Minister of State at the Federal Foreign Office stresses importance of complying with Judgment of EU Court of Justice in relation to Western Sahara trade. 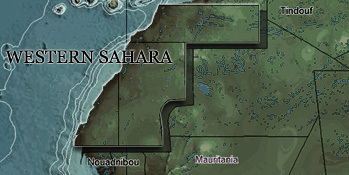 Above: Saharawis do not consent to EU-Morocco trade deal being applicable to Western Sahara. All Saharawi NGOs have protested the EU's plans for their territory. The EU is misguiding the Member States by claiming that there is broad support for such deal. “The Federal Government has repeatedly called on the Commission and the Commission’s legal service to confirm that the adaptation is in accordance with the requirements of the European Court of Justice”, said Niels Annen, German Minister of State at the Federal Foreign Office, when questioned in the Bundestag on the EU Commission's proposal to extend the EU-Morocco Trade Agreement to Western Sahara. “In our talks and in our communication with the Commission, we have repeatedly pointed out and emphasized that the Judgment must be taken into account”. “It is important in our view, that extending the agreement to Western Sahara does not prejudice its international status. We’ve also expressed this to our French partners”, Annen added in response to questions by parliamentarians Katja Keul and Uwe Kekeritz (Bündnis 90/Die Grünen). On 11 June, the Commission sent a proposal it had negotiated with Morocco regarding trade with Western Sahara products, for approval to the EU Member States and the EU Parliament. The proposal comes on the back of a Judgment by the Court of Justice of the European Union (CJEU) of December 2016, stipulating that no EU-Morocco trade or association agreement could be applied to Western Sahara, unless with the consent of the people of the territory. Accompanying the Commission's proposal is a Staff Working Document, attempting to justify including the Non-Self-Governing Territory of Western Sahara in a trade deal with neighbouring Morocco. In the document, the Commission presents the proposal as beneficial to the "local populations", though not backing that claim up with any independent analysis or statistics. Furthermore, the question of benefits was considered irrelevant by the CJEU in article 106 of aforementioned Judgment; what matters is that the people of Western Sahara consent to an EU agreement being applied to their territory. The German government appears to have read the Judgment thoroughly - but also seems to be ill-advised by the EU Commission on the issue of consent - which the Commission has tried to replace by an ex-post consultation process of Moroccan actors that are not representative of the people of Western Sahara. The consultation process is also presented in the Staff Working Document. Polisario never took part in a consultation exercise, as is evident through the correspondence between Polisario and the EU's diplomatic department in the lead-up to the informal meeting they had at the initiative of Polisario. "It is fairly easy for Berlin to find out if Polisario has been consulted or not", stated Sara Eyckmans of Western Sahara Resource Watch. "One only has to contact them, and they will explain that they were not. It would also be useful if Berlin would ask the Commission why it has chosen to 'consult' non-representative actors and not 'seek consent of the people' as the court requires", Eyckmans said. Western Sahara Resource Watch has previously written that the Commission has been misguiding the Member States of the consultation process it has undertaken. In the report it has sent to member states, the Commission claims a "broad support" for a new agreement. That is factually incorrect. 94 of the 112 organisations that the Commission have enlisted in its Annex as “consulted” have either never been invited to consultation meeting, never been contacted by the Commission, or refused to meet the Commission. No organisations or individuals that are pro-self-determination have taken part of the consultation excercise - a process that the Court never asked for. The Member States are expected to vote on the Commission's proposed trade arrangement for Western Sahara next Wednesday, 11 July 2018.